R.I.P. William ” Piper Bill” Millin 14 July 1922 – 17 August 2010. 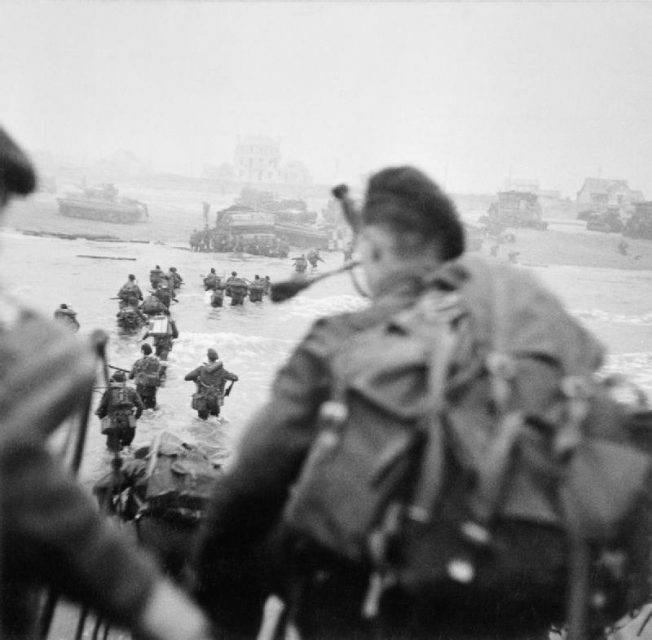 Piper Bill was either the bravest or craziest man that day on the beaches of Normandy. Mortars blasted the day away and hell rained from the sky. The sea quickly took on the color of crimson as the bodies of the fallen floated on all sides. But he kept pushing on side by side with his leader, wading through the water, along with every other brave soldier who was part of the largest military invasion in history to date. Making it through the deep, cold water, he walked onto the shore as more men fell under heavy gunfire and shelling. He had no guns. He had no grenades. But what he had in his hands turned out to be good enough to help him survive that dreadful day: his bagpipe. William “Bill” Millin was a Scot born on July 14, 1922 in Regina, the capital city of Saskatchewan, Canada. He began to pipe his way to fame after he joined the Territorial Army located at Fort William in the Scottish Highlands. 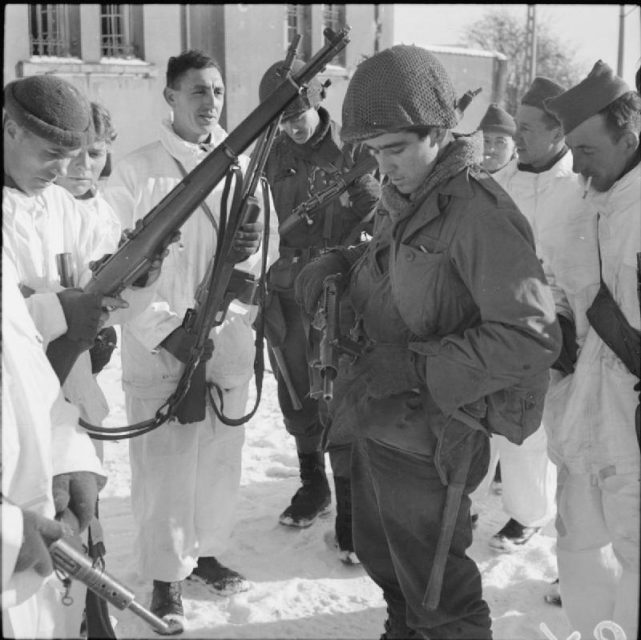 Men from the 5th Battalion, Queen’s Own Cameron Highlanders wearing snow suits, inspect the weapons of two GIs from the U.S. 87th Division during the link-up of the two Allied armies at Champlin in Belgium, 14 January 1945. 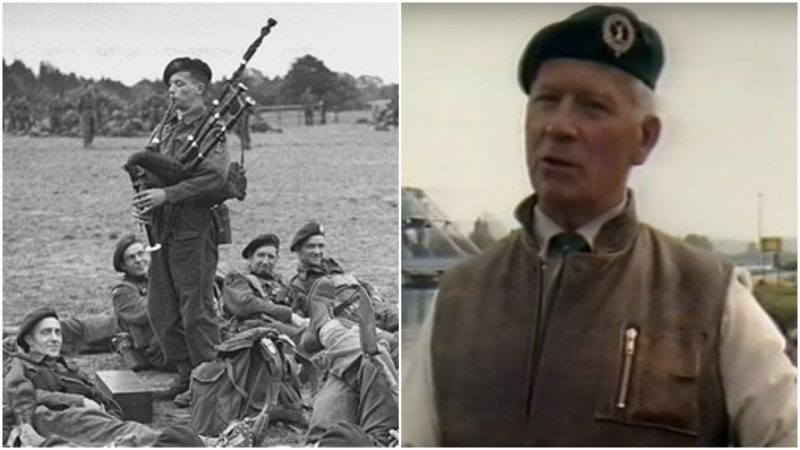 He played in the pipe band of the Queen’s Own Cameron Highlanders before volunteering at Achnacarry in 1941 for training as a commando. There he met Lord Lovat, to whom he would become a personal piper. On D-Day, Bill was one month short of 22 years old. 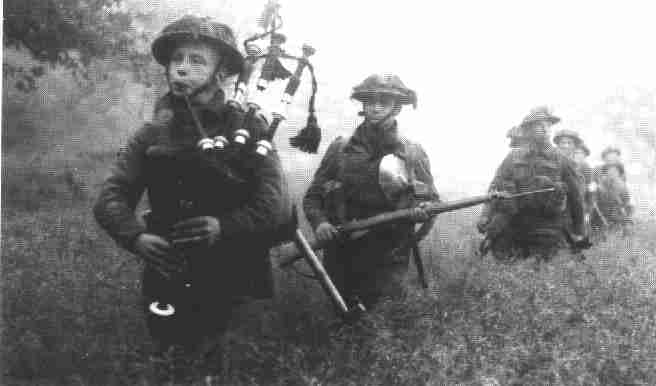 Pipers had previously been restricted to the rear of battles by the British government, after the death of several pipers during World War I. 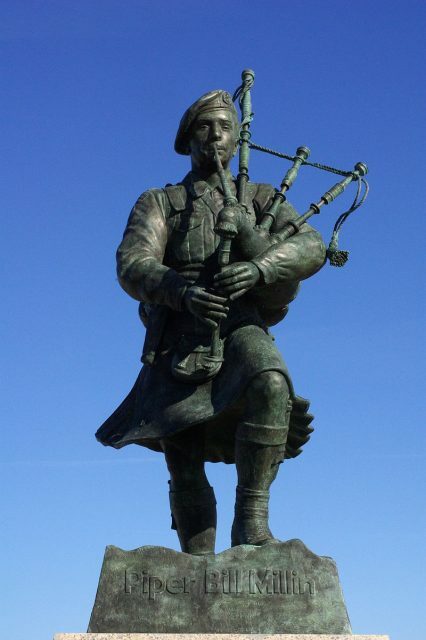 However, Lovat, who was also Scottish, said that the law was specifically for the British and encouraged his personal piper to accompany him at the spearhead of the invasion into Normandy. 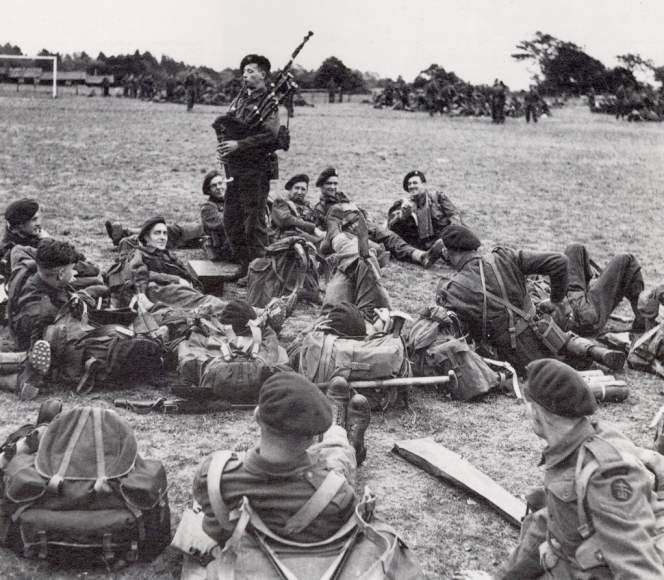 Thus, during the invasion of Normandy, Bill Millin was the only piper on the battlefield, as well as the only man wearing a kilt. His kilt was the same Cameron tartan one his father had worn during WWI. In accordance with Scottish culture, Bill wore the kilt with no underwear beneath. The only weapon he did have on D-Day was a ceremonial dirk, which he neatly tucked into his stocking. As the invasion fleet began to sail, Bill was on the leading craft with Lovat, playing “The Road to the Aisle” on his bagpipes. As they sailed off the Isle of Wight, they met several other vessels carrying troops. The nostalgic tune from the bagpipe was heard by the troops on the other ships, and they cheered and threw their helmets into the air as the song moved them. The waves began to grow unstable as they moved beyond the Solent and into the English Channel, and Bill was forced to stop piping. After hours of sailing in choppy waves, a new day began to set in. The shoreline of Normandy slowly began to appear through the grayness of the budding dawn. Seasick from the long hours of sailing, Bill was particularly excited about getting ashore, paying no mind to the grave danger that lay just ahead. Lord Lovat jumped off the craft first, then Bill and the rest joined him in the frigid water. Bill’s kilt floated on the water as the coldness struck him. Right away, they were met by heavy shelling and machine gun fire. “Play again…’Highland Laddie’ and ‘The Road to the Isles,’” Lovat’s order came as he made for the shore. Bodies had begun to fall all over the place, floating on the water. The atmosphere was filled with smoke and screams and ear-splitting blasts. Bill began to make the bagpipe skirl with haunting tunes of “Highland Laddie” and “The Road to the Isle” filling the deathly air. Some of the soldiers stood still as the songs began to sound in the midst of the chaos, passionately cheering and waving their arms. For a moment they had forgotten that they were in the shadows of death. 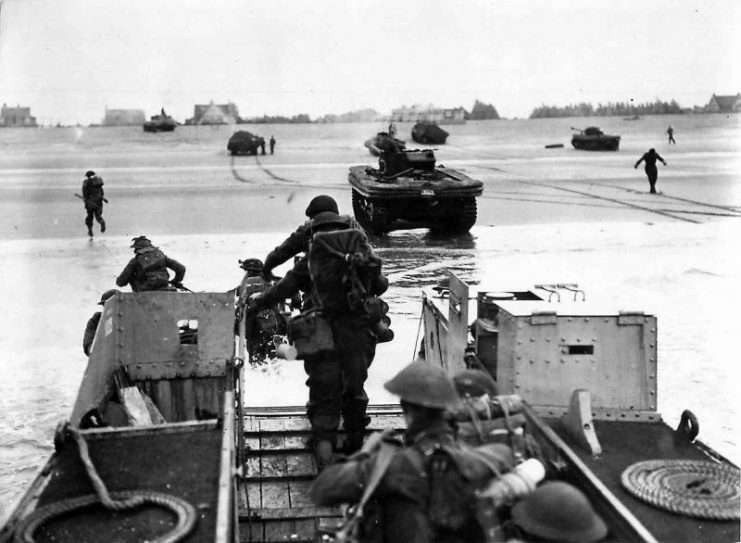 The objective of Lovat’s commando unit was to get past this beach, codenamed Sword Beach, and join up with the troops of the 6th Airborne Division at Pegasus Bridge. Pegasus Bridge had been taken over by the troops of the 6th Airborne Division during the early hours of the day in a surprise attack, which left the Germans unable to swarm into Sword Beach. 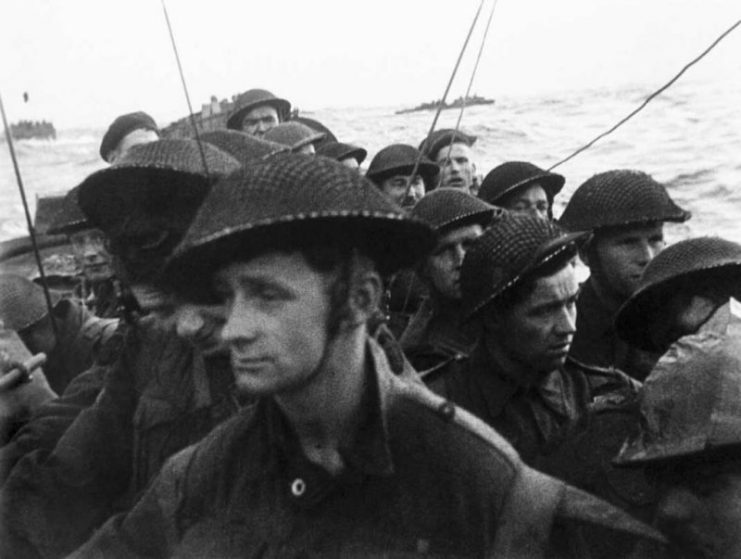 Film still from the D-Day landings showing commandos aboard a landing craft on their approach to Sword, 6 June 1944. While Bill played his pipe, he barely thought about the danger he was in–he was just following orders. Perhaps Death was not interested in a man with a kilt and no underwear that day. At one point, the commandos were under attack from sniper fire. Bill later recalled seeing the flash as the sniper shot at them. Everyone else was flat on their stomachs and Lovat was on one knee as they all lay low to avoid being hit. However, Bill, engrossed by the music of his pipe, was still standing. He stopped playing when he noticed what had happened. Lovat and his group chased the sniper as he ran into a cornfield. After they gunned down the sniper, Lovat ordered Bill to resume his piping. The 6th Airborne Division was kept heavily occupied by repeated attacks from German troops and were surrounded by Panzer divisions. As time rolled by, the pressure on the British troops was gradually becoming overwhelming. They were in dire need of help from Lord Lovat’s 1st Special Service Brigade, which was supposed to be there by midday. Apparently, Lovat and his commandos were running late. But just an hour later, the men of the 6th Airborne Division were drawn by the sound of a skirling pipe, with tones of “Blue Bonnets Over the Border” filling the air. Green berets came into view. Lovat was finally there. 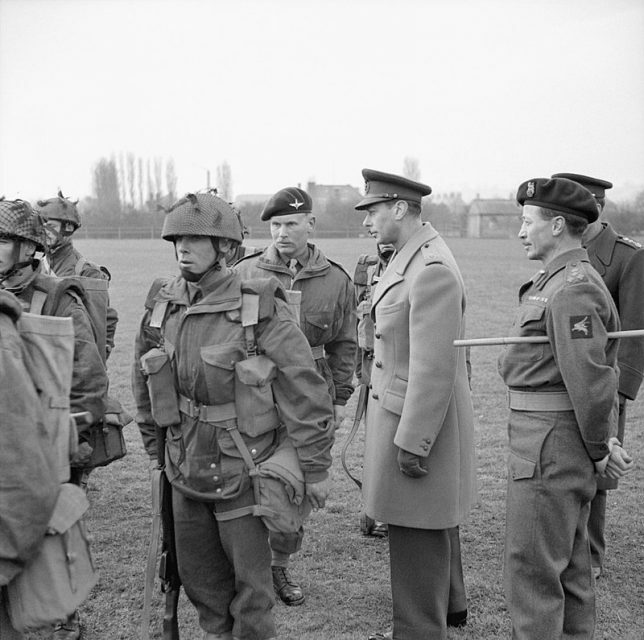 King George VI inspects paratroopers of the 6th Airborne Division, 16 March 1944. 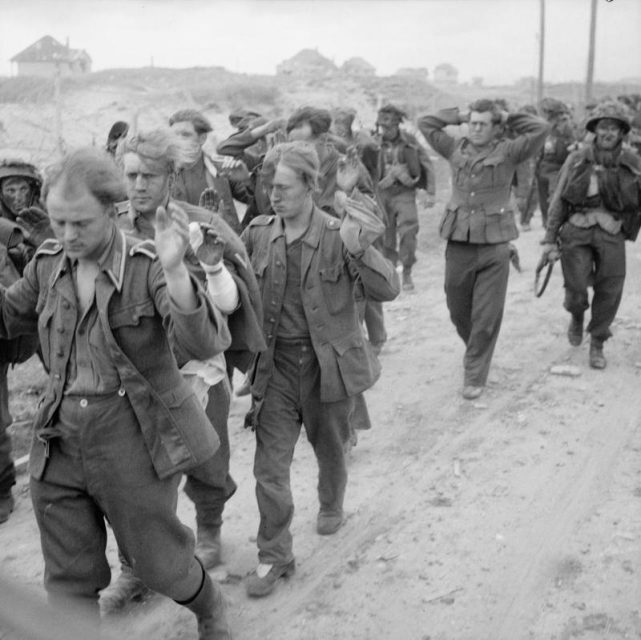 The presence of the commandos lightened the spirits of the troops of the 6th Airborne. 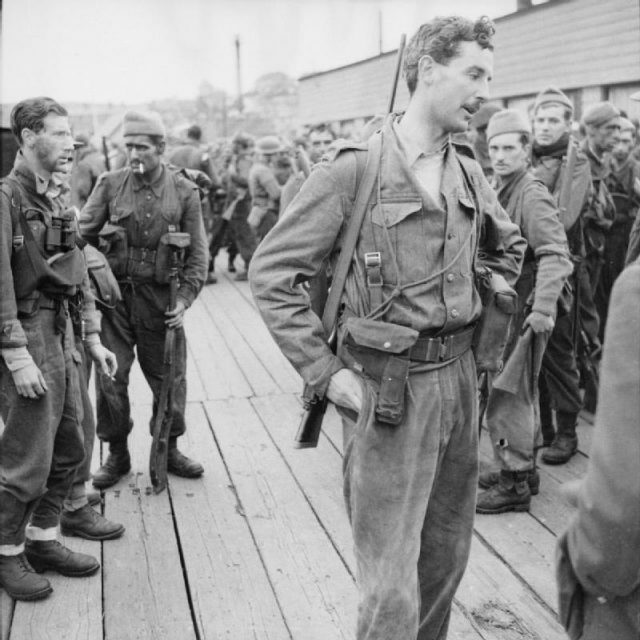 As soon as they arrived, the commandos quickly surged onto the bridge to engage the Germans, with Bill Millin’s resounding tunes filling them with energy. Millin would recall years later that it seemed like a very long bridge. Yet, as they marched across the length of the bridge with Millin at the forefront, he did not sprint, even with danger coming from all sides. The last tune he played was “The Nut Brown Maiden.” He had played it for a little French girl who had walked up to him, full of energy and demanding music as she jumped about. 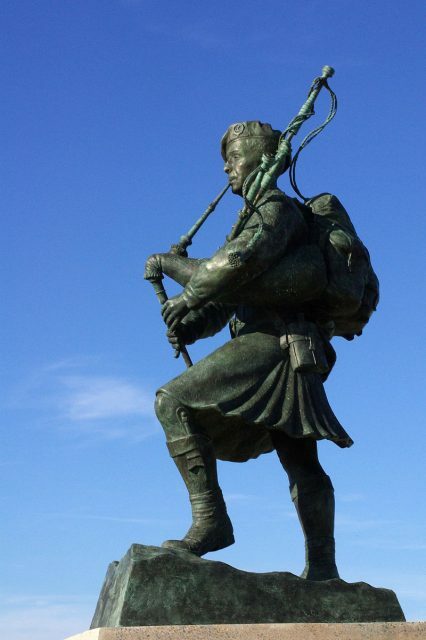 His bagpipe got damaged eventually, after shrapnel from a mortar struck it. However, it was not completely ruined. Bill would later serve in operations in Netherland and Germany before being discharged. He worked for some time at Lovat’s estate before becoming a psychiatric nurse in Glasgow. He visited Normandy several times after his retirement. During Lord Lovat’s funeral, Bill played his bagpipes as a tribute to him. 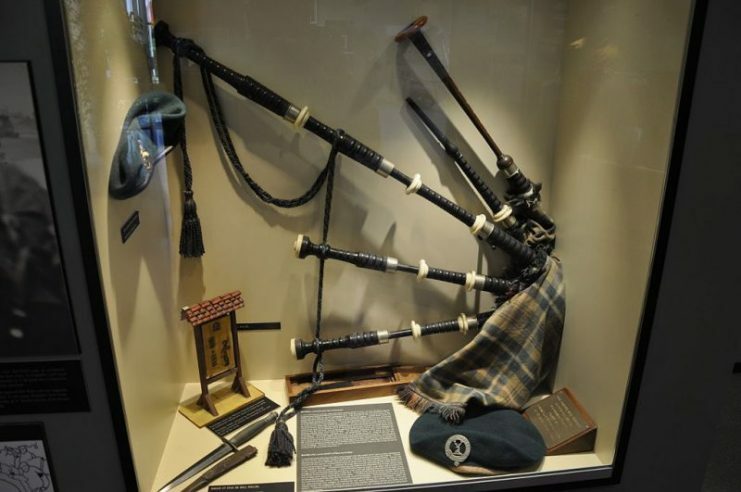 Bill’s main bagpipe was donated to the Dawlish Museum, while another set of spare pipes he had used later was given to the Pegasus Bridge Museum. For years, a big question remained unanswered for him: why had the Germans neglected to shoot him on D-Day, even though he was the loudest and most noticeable member of the invading troops? He got his answer nearly forty years later, during a D-Day reunion. He put the question to one German commander who, in response, tapped his head and said that they had decided to not waste a bullet on a Dummkopf—apparently, they had quickly assumed that he was crazy. Indeed, strutting onto a battlefield with nothing but music was a clear definition of crazy. But this craziness became legendary. 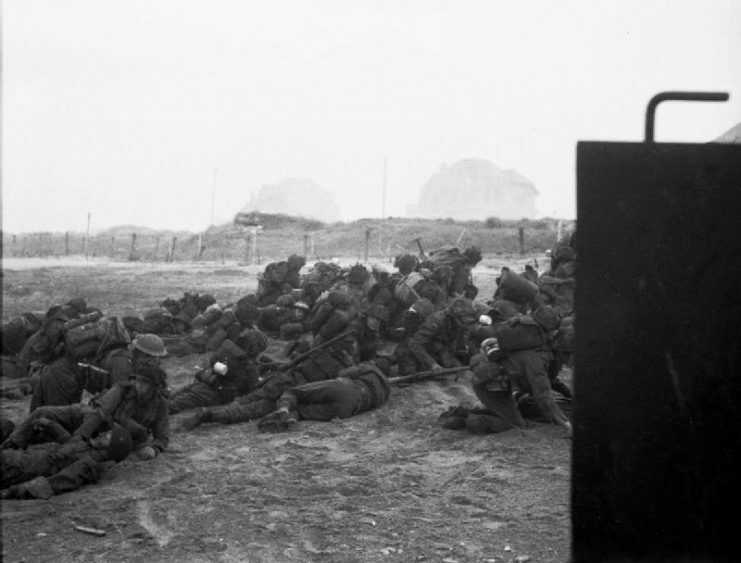 This incredible story of loyalty and bravery led to the immortalization of Bill Millin with a bronze statue at Sword Beach. Millin died of a stroke in 2010. He lived for 88 years, but his story will certainly live much longer.